Bathrooms are functional. Bathrooms are a necessity. But, nowhere does it state that bathrooms have to be harsh, stark or boring. They can in fact be a place of refreshing revitalization and relaxation. Of course, if you have kids you may well want to make a private bathroom for yourself and/or a significant other (should there be one). The kid’s bathroom can be functional, fun and probably filthy. Yours however can be glorious. A place all your own to just get away from it all. Here’s how to achieve the Zen bathroom. Faucets and other water fixtures will dress up a bathroom, kitchen, backbar or any other place there is water. The sink and tub/shower in a bathroom are mainstays of the functionality of this room, but are also the perfect opportunities to bring your special room up to date and make it more modern. Faucets like the extremely popular waterfall taps show that you are in the know, when it comes to bathroom style and design. Personally selected specialized decor. These little odds and ends don’t have to be utilitarian, so, it certainly wouldn’t hurt to step it up. Don’t be afraid to hang art in your bathroom. Make good use of artsy little things like lotion bottles, towel racks, potpourri holders, candles (aromatherapy) etc. that speak to you. 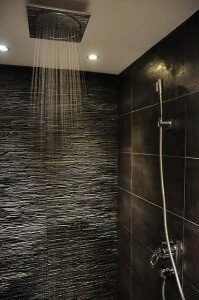 What makes your bathroom your idea of Zen is the fact that you created it. They call this decor for a reason… you are decor-ating here! Lighting that sets the mood might be expected in a dining room or living room, but for the true feeling of a balanced body, mind and soul you need the perfect lighting, in your bathroom as well. Different tasks require different lighting effects. While you are relaxing, for example, you certainly wouldn’t need the same level of lighting you would require for grooming and applying makeup. Light fixtures are one of those things that can change an entire room. Combine storage and seating with accessories like wicker baskets with covers. These offer a place for toilet paper, towels, laundry etc., but should be sturdy enough to sit on, as well. They are an attractive way of storing things that are anything, but attractive. Smart usage of space is a must to reduce the appearance of disorganization and clutter. And speaking of towels… It is vital that you care enough to spend a little bit in this category. Color coordinating can be left to the kid’s bathroom. Those big puffy white robes and soft plush towels you find at the best spas and resorts are what you need, in your Zen bathroom. And, when it comes to that special ‘just for you’ bath towel… the bigger the better. An indispensable part of any Zen room is of course, its offer of complete and utter privacy. That means a secure lock on the door and possibly even a sound machine to lightly drown out the sounds of the busy world around you.